UniVerse Publishing will be at Thought Bubble 2014 this coming weekend (15th-16th November) at Table 36 in the Royal Armouries Hall. 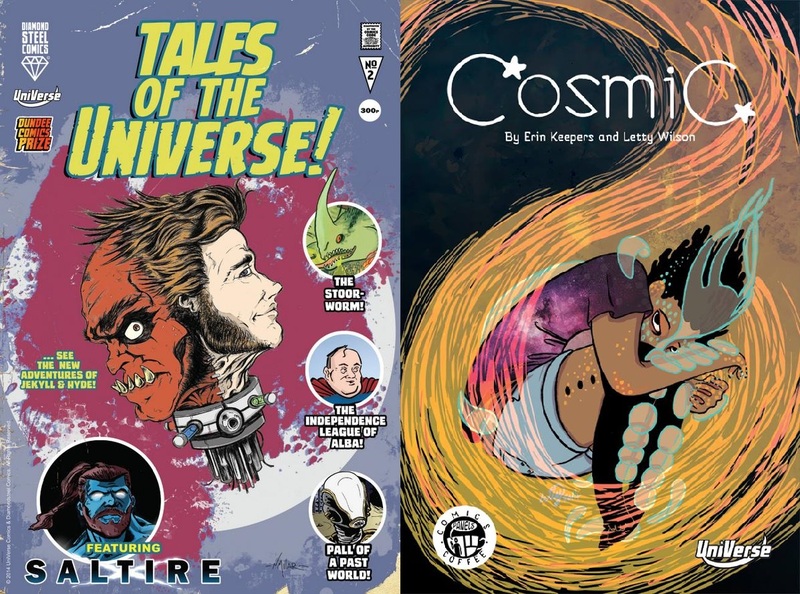 In addition to comics and anthologies it has published in the past, UniVerse will be selling Tales of the UniVerse #2 and launching Cosmic #1, two exciting comics featuring talented writers and artists from the University of Dundee and around Scotland. As was the case with Tales of the UniVerse #1, issue #2 features Scotland-themed comics by the winners of the Dundee Comics Prize. The winning comic for 2014, ‘The Stoorworm’, is a Godzilla-like story with a Scottish twist created by Cale Ward (writer) and Letty Wilson (artist), both graduates of the 2013-14 MLitt in Comics Studies course. The runner-up comic, ‘The Independence League of Alba!’, is a political satire created by writer/artist Gavin Boyle. The comic also includes two comics by Comics Studies MLitt graduate Norrie Millar, one of which is set in the universe of Diamondsteel Comics’ Saltire. 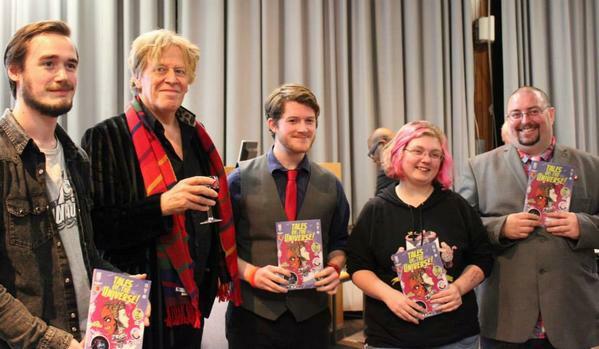 From left to right: Norrie Millar, legendary comics creator Pat Mills, Cale Ward, Letty Wilson, and Dr. Chris Murry at Dundee Comics Day 2014. 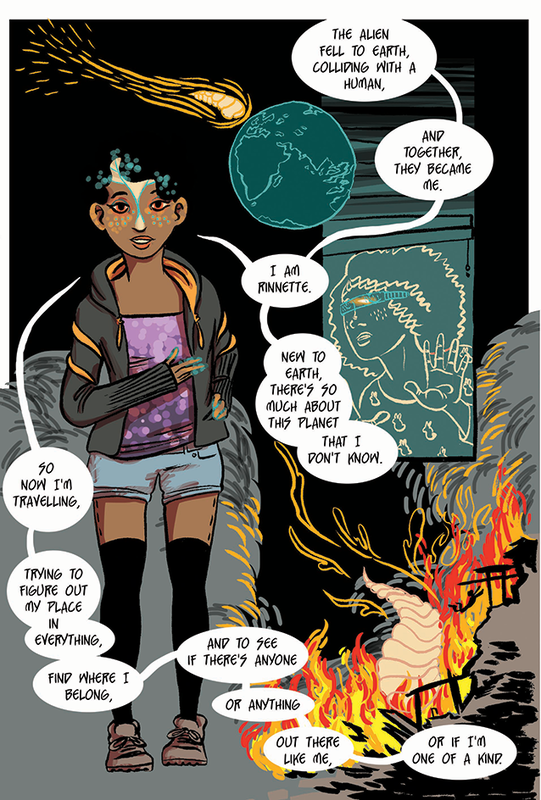 Cosmic is an exciting new sci-fi epic created by Comics Studies MLitt graduates Erin Keepers (writer) and Letty Wilson (artist). This issue is the first in what is planned to be an ongoing series. Cosmic follows Rinnette, a human/alien hybrid born out of the violent crash-landing of an alien on Earth. Rinnette is entirely new to the world and has an awful lot to find out about it, and she’d better learn fast, as her cataclysmic origins have not gone unnoticed. Featuring secret agents, rabbits, parasitic aliens and all manner of extraterrestrial excitement, this is a sci-fi adventure for all ages that aims to ask big questions. You can learn more about Cosmic here and read a sneak preview excerpt here. We hope to see you at Thought Bubble, but if you will not be there and are still interested in these exciting comics, please drop us a note on Twitter and we’ll be in touch!